The Application is downloadable via Play Store (Android) and App Store (iOS), typing the name of the App as “Khmer Rouge History”. The App consists in eight main chapters, and divided in 39 sub-chapters which might be developing with some more sub-chapters accordingly. Conducted by Bophana Center, “App-learning on Khmer Rouge History” is a proposed reparation project for civil parties in Case 002/02 before the Extraordinary Chambers in the Courts of Cambodia (ECCC), under the grant of the European Union and Rei Foundation Limited, under the Khmer Rouge History Programme implemented in indirect management with the United Nations Office for Project Services (UNOPS). The project consists in the creation of an educational multimedia application about Khmer Rouge history and its wide diffusion with free online access. The created application will be used in high schools and universities in Cambodia, as a complementary tool for the national education curriculum which may facilitate the work of teachers by proposing an alternative educational approach in dealing with KR history in the classroom. The project is supported by the Ministry of Education, Youth and Sports as its cooperative partner. Being proposed as a judicial reparation project for civil parties in Case 002/02 before ECCC, the project will also be implemented in close collaboration with Civil Party Lead Co-Lawyers Section (LCLS) and Victims Support Section (VSS) of ECCC. 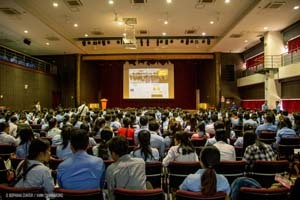 The objective of the project is to educate youth on Khmer Rouge history by using an innovative multimedia application consisting of accurate and standardized information validated by Cambodian and international experts of Khmer Rouge history, as well as to raise awareness about justice, human rights and peace, fostering intergenerational dialogue between Khmer Rouge survivors and youth. Films, photos, media articles, text documents, music and audio files are selected and newly produced by a team composed of writers, archivists, audiovisual technicians graphic designers and IT experts under the supervision of Khmer Rouge history experts, and compiled in the form of a smart device application, which represents one of the most user-friendly and sharable interfaces for Cambodian youth, the core target beneficiary of the project. The application contents are also consistent with the findings of the Trial Chamber and reflect the ECCC’s work and its legacy, containing the works of the Court and the judgement. A large number of testimonies from Civil Parties are also included in the application. In Cambodia, about 70% of the total population is under 30 years old. Young generations do not know much about what occurred under the Khmer Rouge regime. A state of collective denial of the past atrocities is even observed amongst youth. Encouraging youth to face Khmer Rouge history, accompanying them with relevant and attractive tools in their search for the truth, is crucial for a social transformation of Cambodia. To maximize the use of the learning application at a national and international scale. It offers compiled accurate and standardized information on Khmer Rouge history. The application potentially attracts youth: one-third of youth (15 to 24 years old) in Cambodia has internet access. The project capitalizes on the power of archives as historical evidence: thanks to the power of moving image and sound archives of the time, the project will help youth to witness history and to believe in what really happened. The project is innovative: with an entertaining tool and activities, the project proposes an alternative educational approach in dealing with KR history in the classroom, different from classical educational methods. The project is interactive, mobilizing social media platforms: one-third of young Cambodian under 30 years old are registered on at least one social media platform. Capitalizing the social media, the created application will play a role of crossroads for discussing about the Khmer Rouge history, so that young people are not left alone facing a difficult topic. The project is intergenerational, encouraging dialogue between Khmer Rouge survivors and youth. The application can be disseminated widely online and via social media for free of charge, nationwide and worldwide. The project is officially supported by the Ministry of Education, Youth and Sports as well as by ECCC Civil Party.